Oh the perils of measuring the diameter of stuff that isn't round. Raytheon recently touted the weapon at the Farnborough International Air Show in England, saying its goal was to emphasize the weapon’s “game-changing capability.” She said international companies, especially those buying the F-35, continue to express interest in the weapon. StormBreaker was designed to fit in the internal bay of the F-35, she noted. As for the name change, Stagg said it “better characterizes the weapons ability to identify and destroy targets in adverse weather or atmospheric conditions using a tri-mode seeker. ‘Storm’ can also mean an onslaught of incoming threats,” and the weapon is capable of defending against such threats by breaking “through storms with agile precision to destroy its target.”"
Will really be cool when a single Meteor / AIM-120D can be replaced by 2 SACM. lrrpf52 wrote: The SDB really changes things in several ways. Even when configured for VLO penetration, it offers a very mixed internal stores arrangement that will bring flexibility to a single sortie. The persistence, weapons mix, sensor fusion, network-linking, and ability to do different roles on a whim is going to be scary, especially since you can coordinate fuel status with each other and work that into coverage where work needs to be done. I'm seeing all the internal pubs and concepts from the 1980s come to fruition in exquisite detail. Yes, many think of weapons loads as always being of equal types. Like two Amraams and two JDAM's. Yet, depending on the mission profile that could vary considerably. This could also vary between aircraft in one squadron during a mission. Not like they all have to fly with the same specific weapons load! GBU-53 for what block 4 or 5 and what variants please ? GBU-53 is slated for Block 4.1 via UAI. SpudmanWP wrote: GBU-53 is slated for Block 4.1 via UAI. 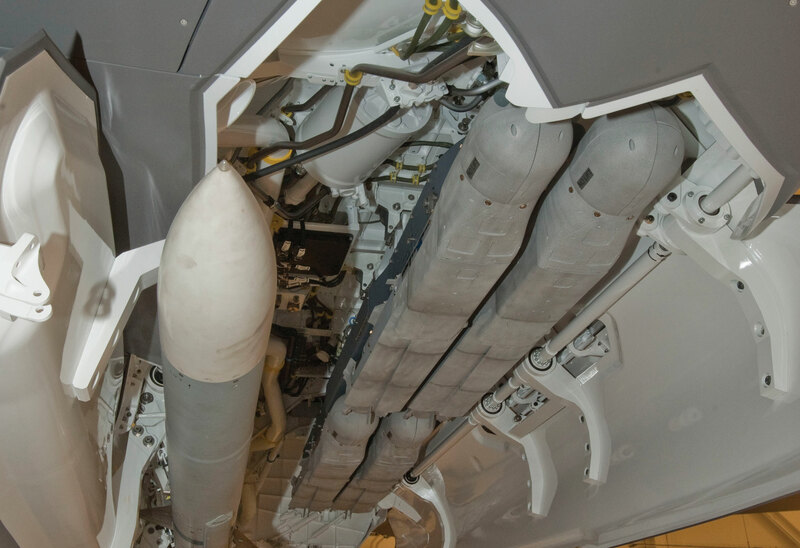 Good thanks but the F-35B with its truncated weapons bays have some problems and 3 or 4 in each ? "...“If the weapons bay has to be redesigned to accommodate [new] weapons, we’ll only be redesigning it one time,” Bogdan told reporters after the Norwegian F-35 rollout ceremony in Texas last month. “We intend on only redesigning the weapons bay one time, so we’re looking at all the weapons together, to figure out what the weapons bay has to look like to put any or all of the weapons on there so you only have to do it once.”..."
In other words, they fit, but there's a hydraulic line and a bracket that need to be slightly shifted / redesigned for proper safer clearance. If there are 4 SDB's in the bay, are there room for the AIM-120 as well? Does not look like that from the picture, but I could be wrong. lamoey wrote: If there are 4 SDB's in the bay, are there room for the AIM-120 as well? Does not look like that from the picture, but I could be wrong. As the inner bay rotates closed, I believe the AIM-120 mounted on that inner bay door will end up basically just above the head or through the head of the crewman in the above photo (the helmet with "ORD" on its rear face). Curious = is there any kind of known plan or timeline for adding those 4xSDB pylon racks for F-35? I guess 8xinternal along with 4 500lbs on the wing is still a significant CAS loadout, but I'm thinking for something like an anti-armor role you'd want as many SDBs as you could get off the ground with. SDB2 is part of Block 4/UAI so the capability will be added anytime after Block 4.1 if it's not included.